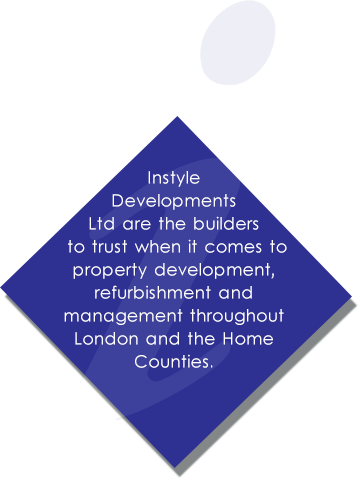 Instyle Developments Ltd are the builders to trust when it comes to property development, refurbishment and management throughout London and the Home Counties. You are guaranteed stunning and reliable build quality when dealing with us. We have been converting lofts, extending properties, adding value and living space to homes and providing comprehensive property management services for well over 18 years. Need reliable, visually impressive and long-lasting building work carried out at your home or business property? Call the expert builders at Instyle Developments Ltd today on 020 8300 8200 and arrange your FREE survey and no obligation quotation. We specialise in extensions, loft conversions and property refurbishment services that make a huge difference to the appearance of your property, while at the same time increasing the value of your home or office. Our builders have been carrying out domestic and commercial building, construction and property maintenance services for over 18 years. The experience and expertise they have gained is reflected in the quality of work we provide; everything we do meets our exceptionally high quality and safety standards. The experience of our builders and our strict project management ensures that every project we undertake, no matter if building, refurbishment, roofing or property management, is completed on time and to budget. Having worked in the building and construction industry for just shy of two decades, we have developed close working relationships with many of the biggest suppliers and manufacturers. The savings we make from dealing with these companies are passed on to you in our affordable and competitive prices. Based in London, we work throughout Kent, London and the Home Counties, specialising in domestic and commercial building and property maintenance services. Many of our recent projects have been for clients in Orpington, Bromley, Croydon, Watford, Islington, Greenwich, Lewisham, Stratford, Enfield, Romford, Putney, Chelsea, Kensington, Victoria, Reigate, Redhill, Stevenage, Chelmsford, Colchester, Guildford, Slough and Barnet. If you require any more information about our building, construction and property maintenance services, please do not hesitate to contact one of our helpful and friendly staff. They will gladly answer any questions and arrange your free site survey and no obligation quotation.